Because they contain healthy fat in the form of nuts and butter. Because butter just got voted as a healthy fat. Because maple syrup is a beautiful thing. Because you could sprinkle crispy bacon on top and it would probably be amazing. Because they travel extremely well. Because they make cute gifts. Because your coworkers will love you. 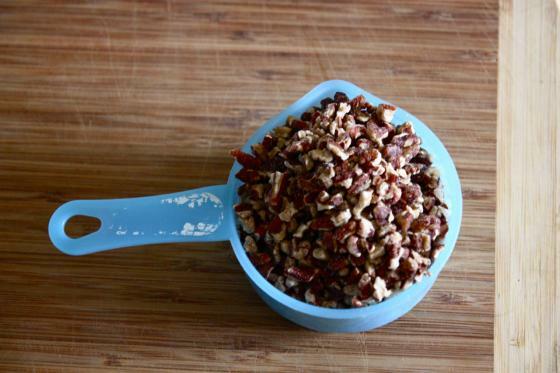 Because your boyfriend will love you (even if he doesn’t like pecans). Because the shortbread crust will make you swoon. Because they’ll make you lift your cat’s paws in celebratory dance. Because the scent of these cooking will attract cute neighbors. Because you don’t have to worry about pie crust. Because you don’t have to worry about pie in general. Because bite sized desserts don’t count. Because pecan crumbs don’t count. Because Thanksgiving is next week. ….and because it’s just a good idea. I don’t know about you, but I don’t really get all that excited about pie. I mean, sure, I love peach pie and I have a heck of a good time making my own crust from scratch, but the cold sad truth is that if faced with an elaborate dessert platter, I’ll always pick cake. Yep, I’m a cake girl. I just feel like you get more bang for your buck. However! Then I discovered these maple pecan bites. They’re like small slices of extra loaded pie (kinda like a baked potato?) with all of the fixins’ and none of the mess. Usually, pecan pie recipes call for corn syrup, but I opted for pure maple syrup instead…a worthy substitution indeed. I love the flavor complexity that the syrup brings, and maple plus pecans? Plus shortbread, plus brown sugar, plus…..butter? So……you got an hour? You got a bag of pecans? Let’s go! 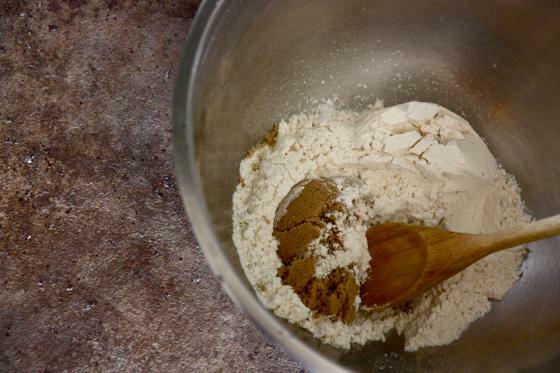 Mix together: one cup flour, pinch of salt and a quarter cup brown sugar. Add six tablespoons of cold butter. Work it baby, work it! Now, press that mixture into a greased nine inch pan and bake for twenty minutes. It’ll get all nice and toasty lookin’. While that’s baking, melt some butter on the stove and add these fun things. Plus a little vanilla and just a smidge of cream…. (it’s a good idea). and then pour all that loveliness right onto your hot, golden crust. Moaning is allowed here. In fact, it’s recommended. Bake for twenty minutes. Let cool (or else you will burn your fingers off), slice and eat. Repeat. 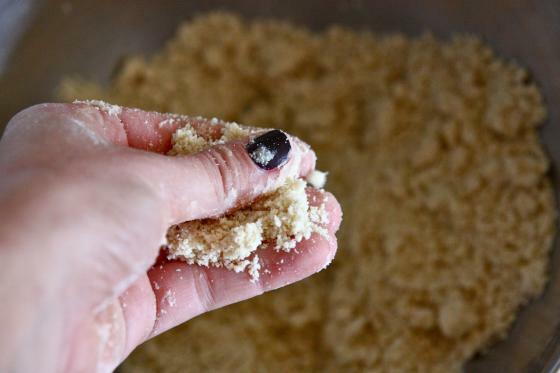 In a large bowl, combine the flour, 1/4 cup brown sugar and salt. Cut in the six tablespoons cold butter with your fingers, working the mixture together until crumbs form. 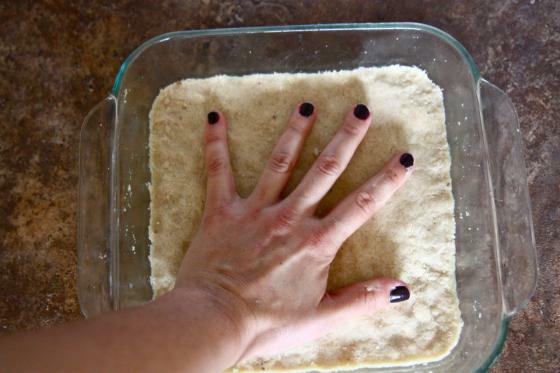 Press shortbread into a nine inch pan sprayed with cooking spray and bake for twenty minutes, or until golden. Remove hot crust from oven and set aside. 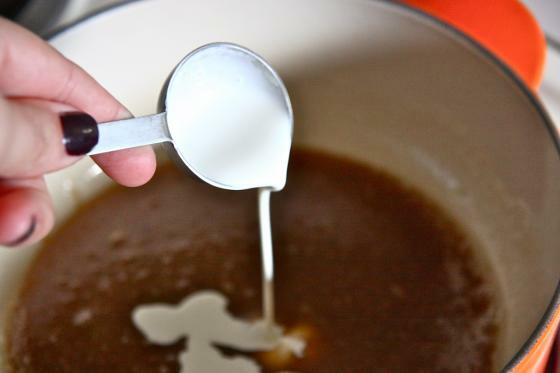 In a small saucepot, melt the remaining butter (four tablespoons). Add the brown sugar, maple syrup and cream and whisk well. Simmer for one minute while whisking continuously. 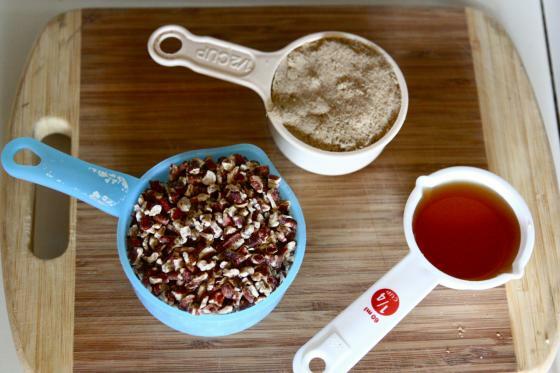 Add the pecans and pour into the hot crust. Bake for 18-20 minutes. When done, remove from oven and let cool for half an hour—this gives the bars a chance to harden. 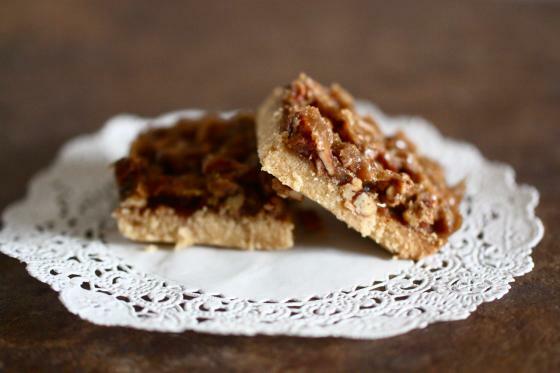 **These maple pecan bites are also being on The Pioneer Woman’s Tasty Kitchen site…today! 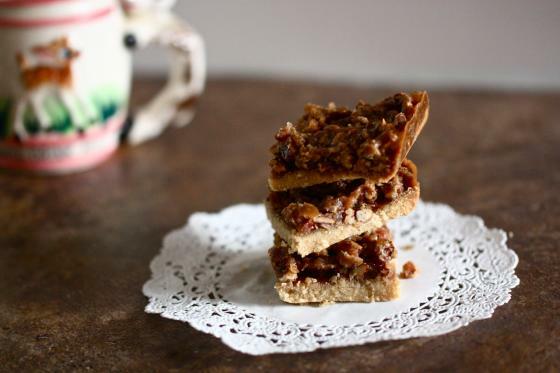 The reason I will be making these today… because NO crumbs count!! I love pecans. And since they are bites, you get to eat even more than normally. Yessss. We make these at the bakery where I work, but cut them into triangles and call them “pecan triangles”. Haha. So yummy! A cake girl?! and here i was, hoping we could be friends! 😉 I’m a pie girl. Always have, always, will…I’ll blame in on my Pennsylvania Dutch roots… hard to escape ’em! Pie is good too. I just need something I can sink my teeth into! And, as always, bacon really is a good idea. Woah those look AMAZING. Sort of like a bite size pecan pie? That would be SUCH a great dessert for Thanksgiving!! These look incredible! I am with you on the pie thing. I made blueberry crumb bars this summer…because bars > crumble. Making these as soon as I get home for break! I love living in a maple syrup state – my aunt and uncle and tons of other friends make it, so we always get gallons of maple syrup for a good price. I want to leave work and make them – right now! Oh my gosh, these look incredible. Adding everything to my grocery list… now! I love a good cake over pie any day too! But these just scream Tgives, you are right! These look amazing!! And since they’re so small…they don’t really count as dessert right?! Right. Delicious. These look fantastic. I printed this recipe out immediately. Those look perfect for thanksgiving. I love pecan pie, but all the recipes call for shortening. This is all-butter – so excited to make this! Ok I think I found my play on pecan pie for Turkey Day!!! 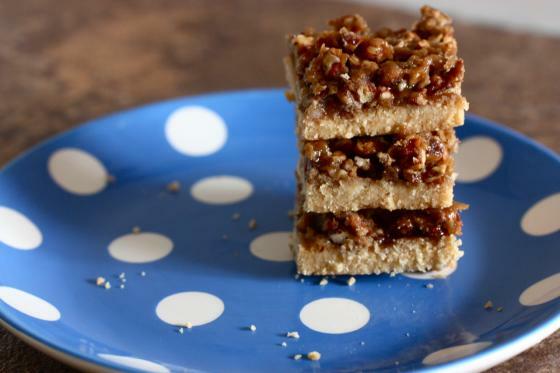 Because I can bring bars to work–not so much with a pie. These look amazing. These look wonderful, my husband will love these! Thanks! I definitely agree with Tina! Challenge On! After work I will be making these, I have all I need. Great “reasons” too, I am sold. I totally agree with #17. 🙂 Bite sized desserts never count. Those look delightful! But I’m not going near Pea Kitty’s paw. I could lose an eye. hahahah that made me laugh out loud! Oh how delicious… I can’t make them until I have somewhere to BRING them though, because I’d eat the whole darn tray! I’m swooning. I’ve only had pecan pie once and LOVED it. I wish butter would be considered a healthy fat. You just answered my prayers! Thank you!!! I’ve never had pecan pie before! My family always has apple, but those pictures are making me want to break the tradition. Actually I don’t think I’ve ever even eaten a pecan in my life. This should change soon, I’m adding this to my “to bake” list over Thanksgiving break. I promised my roomies I would halt all baking adventures in our kitchen until after Christmas for our waistline’s sake. I’ve got this recipe bookmarked, and now it’s just looking like finding a spare hour will be the hard part! OH MY GOOD folly miss molly!!! This looks unbelievably good!! I know what your talking about, I’ve made pecan diamonds before, and they are so easy and yummy. I agree with you about pies, they’re messy and the crust can make or break the whole thing. Give me a cupcake anyday, and I’ll be happy. Stop it with these delicious looking baked goods! 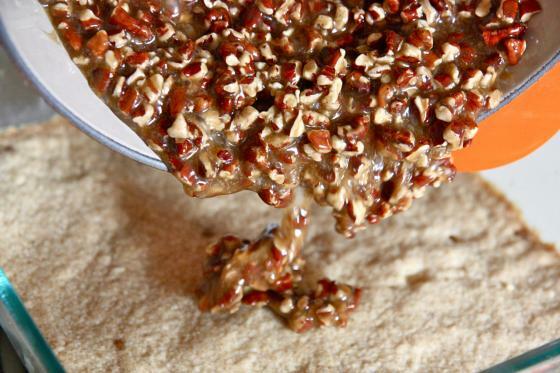 I heart pecan anything! OMG these look and sound so amazing!! I will definitely have to make these!! I have all of those thing. I want to make them. Can you always substitute maple syrup for corn syrup (as long as the flavor would fit, of course) ?? No—-corn syrup lends a really chewy final product. Maple syrup hardens a little more; it doesn’t stay super chewy. Ahhhh! These look incredible, and love the idea of the crispy bacon on top. These look amazing, and the reasons add up and speak for themselves. However, what are your thoughts on walnuts and not pecans? I’ve never been a huge pecan person. Pecan pie is my favorite dessert of all time. Thank you for giving me portion control!! 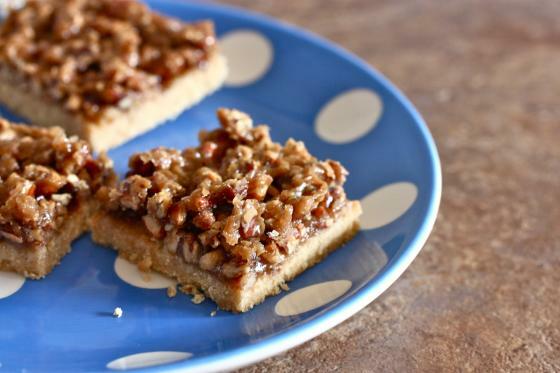 These look insanely good and are the epitome of homemade holiday dessert food…I remember my mom making similar things b/c my dad is a huge pecan pie + maple lover. He would adore these! 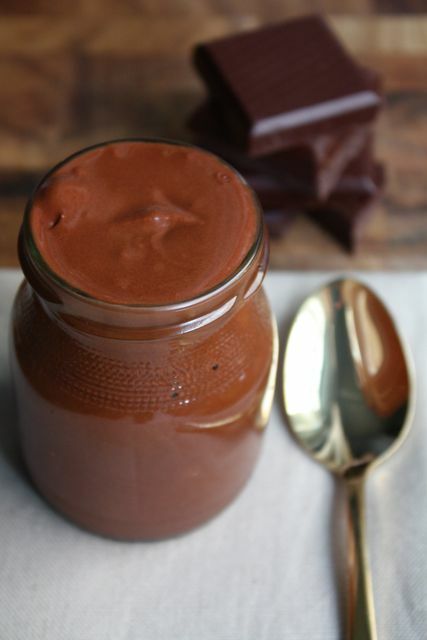 and of course am drooling over the recipe…done in under 1 hour: huge bonus! These.are.perfect. I totally would bake these today except I promised myself I wont go shopping for the rest of the week since I’m going home in a few days..but I will once I can get the ingredients! These look like the absolute perfect comfort food on a rainy, chilly day as it is here in NYC! My two fave bloggers together at last! So excited to see it on Tasty Kitchen. I’m going to try these out over my Thanksgiving break. I have got to figure out how to bake gluten-free because your recipes make me droooool! These look super easy to make! I will add these to my baking list for the holidays! I might give these at small gifts in cute little tins! I don’t bake (or cook)… I just love etaing. ha. But I love pecan pie and your list of reasons why I should make these really convinced me. I am going to try it this weekend! If bites counted, everyday would be a cheat…and I cannot have that!! Oh crap. That looks insanely delicious! Fiance (who hails from Santa Rosa, btw) and I were at costco this weekend & I wanted a gigantic bag of pecans for some reason. He said ”only if you make me a pie.” and I said yes. and then I said but I’m not making the crust from scratch (because, let’s be real here. it’s a pain in the arse). and then he said ”but the crust is so important!” and then you posted this recipe, and saved my life. Shortbread is currently in the oven. Thank you. p.s. 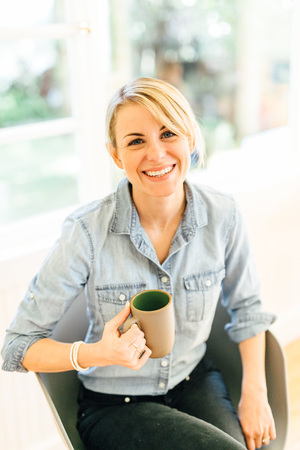 I heart your blog. and I have a huge girl crush on PW, so HUGE congrats on Tasty Kitchen. I like this list. I like this list indeed. I will perhaps decide to make these. No matter the fact that I am allergic to nuts. Nope, that list is too good. These are just what I have been looking for! This Thanksgiving is the first year that my husband and I won’t be traveling home for the holiday. So we are trying to find dishes that are not too overwhelming for just two people (we don’t to be eating leftovers for dayyyyyyssss). These bars look like a happy medium of not too much but not too little. 🙂 Can’t wait to make ’em. i made these during glee last night to bring to work today. oh my, they are absolutely amazing…even though i may have left them in the oven a minute too long. 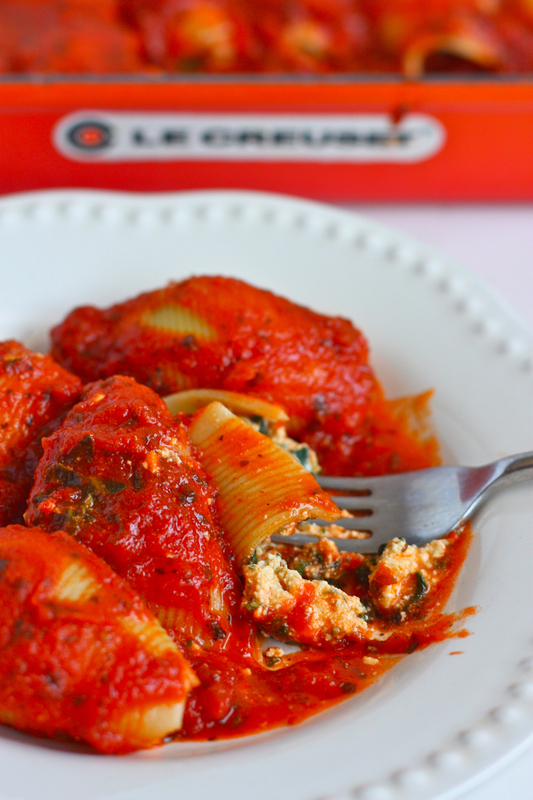 total foodgasm….thanks for another great recipe! would these freeze well too? Jenna! 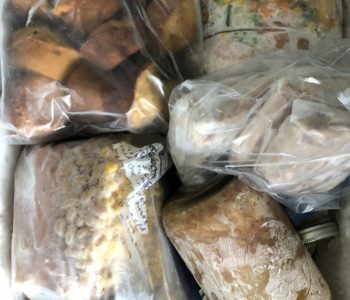 Do you have experience in baking with gluten free flour? I REALLY want to make these this weekend for my guests but I don’t know how the substitute would work out? Any advice? Gluten free flour for regular. Please let me know!! I cook gluten free due to an allergy also. I haven’t tried this yet, but I would think a mixture of flours would work well. I would likely use a mix of white rice flour, almond flour (helps w/ texture), potato starch and brown rice flour. Don’t forget to add 1tsp of xanthum gum so everything sticks together. Oats would work well I would think, if you can tolerate them. Thank you! I appreciate it. I’m going to give it a shot tomorrow. My guests are coming on Sunday so if it doesn’t work out i’ll have time to make a different batch. Sooo… I made these today and they are downright amazing. However I didn’t get that division between the shortbread and pecan topping, it all kind of melded together. Any suggestions for when I made them for thanksgiving? That’s weird!!! Are you sure you baked the crust enough? I can’t think of any other reason that would happen. The crust should be golden brown and then you pour the hot pecan/maple syrup mixture on top before baking again. Lemme know! Jenna, I’m thinking of making these for Thanksgiving this year, but I was curious about why you used salted butter vs. unsalted in your recipe. I almost always use unsalted for baking! I always use salted butter! I think it gives baked goods a little oomph! You could use unsalted if you preferred, but I always opt for salted myself.. These I need to make NOW. But I don’t have pecans. I can’t wait to give these a try. I have to work this weekend so I deserve a treat! Made a batch today for my husband to take to work but we ate them all ourselves! Now I have a second batch baking in the oven now 🙂 Thanks for the delicious post. I made these for my co-workers … and now they love me!! These are delish!!! Just made these for my family, and they LOVED them! My dad is a pecan pie fiend, and he gave his stamp of approval in the manner of eating seven squares of these. I think this will become a regular around the Thanksgiving holidays. 🙂 Thanks! Made these yesterday and had to have a little taste this morning while I was cutting them up for the dessert tray – delish! I made these as part of my contribution to Thanksgiving dessert yesterday — they were a HUGE hit! Probably one of my new all-time favorite desserts. do you grade a or grade b maple syrup? Do you think you could freeze these? These look awesome! Thanks for sharing. Will definitely be making these in the near future. I haven’t made this yet…but I love it! Just made these for our office Thanksgiving lunch and they were a hit. The small, bite size was great. Will make them again next year! I’m currently on maternity leave and brought my new baby at work for a quick visit along with a batch of these squares. Even those on a diet could not resist having seconds and thirds (and neither could I).